Next day, we left Chamrajanagar at around 6:00AM and we were the first make an entry at the BR hills forest check post. 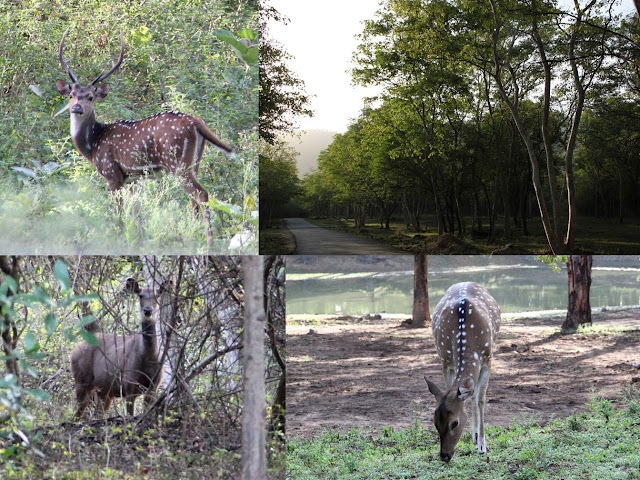 The entire drive uphill was amazing with a feel of blending into the wildlife. We did see a lot of deer’s and birds but no elephants or tigers which are supposed to be other inhabitants in this forest range. We also pass through Jungle lodges which have guest houses for stay and arrange safari and trekking in the forest. But a much cheaper option is “Giridarshini (9383325042)” near the temple. It’s a nice homestay and they also arrange trekking in the forest. 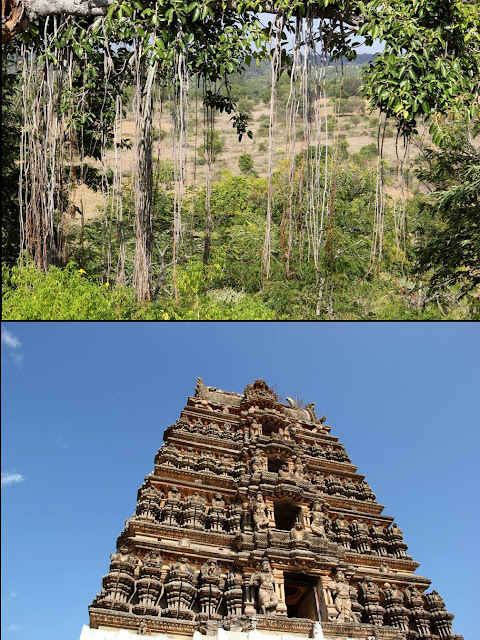 Biliranganathaswamy temple is situated on the summit overlooking beautiful scenery. After a quick darshan we walked to the view point where the crowd was watching a herd of elephants in the hills. Next stop – A small hanuman temple at the foot hills of BR hills while driving towards Yellandur which is famous for its sleeping Hanuman idol. 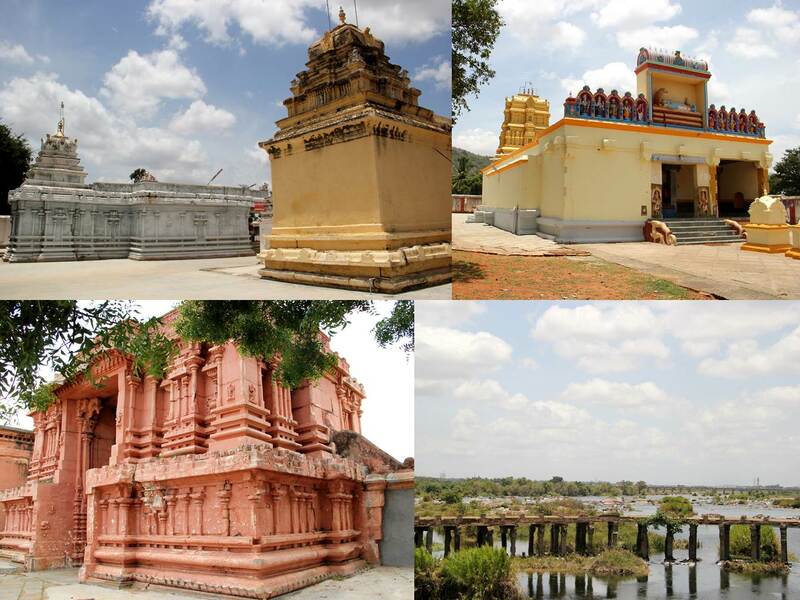 Our next search was to find a Veerabadhra temple in a small village called Mookhalli. We drove towards Yellandur and took a deviation to Mookhalli. Finding this village was an adventure as we had to take several deviations and get into to real rural India. It’s a beautiful village; the kind where everyone knows everyone else. The temple priest came running to greet us, opened the door. At Agara; another temple –Rameshwara swamy temple where several Brahmins were chanting some mantra creating a divine atmosphere. We next drove to Shivanasamudra via Kollegal. 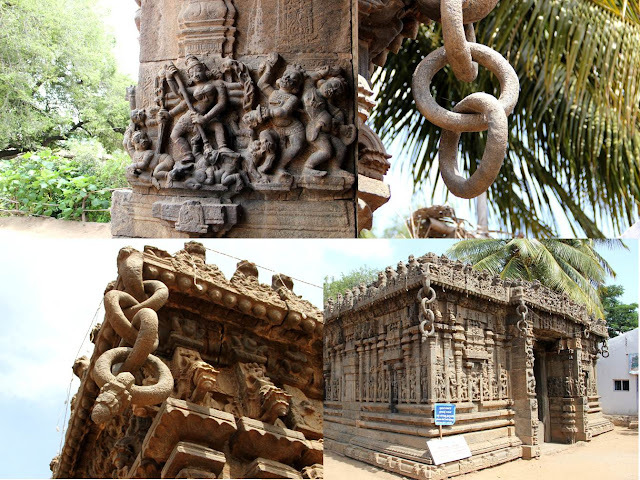 Attraction here are – Someshwara temple, Madya Ranganathaswamy temple, a Darga, Gaganchukki and Barachukki water falls. We did not go down to the falls, as it looked like a difficult trek for my parents. We returned back to Bangalore via Kanakapura at around 4:00 PM. It was a great trip as though I had a list of place to visit; the trip more or less was unplanned. Finding hotels in Mysore and Chamrajanagara; waiting for a priest in Channapanapura; finding Mookhali temple and more was a great experience. And the fact that my parents were part of it made it much more exciting. My mother is always interested to know about my travels and explorations and during my previous travels with her; especially on our way back from Gadag to Mangalore, I realized from where came my zeal to explore. We stopped at a field where farmers were harvesting red chilies. Amma and I spoke to the villagers and they were very nice to offer us their meal – Bhakri (Roti made of corn) and special chutney made of chilly; dishes specific to northern Karnataka. While others hesitated, we gladly accepted and tried the food. So I always wanted Amma to be part of my research on the districts of Karnataka. And so when my parents were here during August, I planned to cover most of Chamarajanagar. We left Bangalore on a Saturday evening (Aug- 18th) on my car and drove to Mysore. On the way I took a deviation at Bidadi to show them my office. Another stop at Adigas near Maddur and we were at Mysore by 7:30PM. Hardest of all was to find a hotel. Being a long weekend the lodges were full. We drove to several and finally found one. I hoped to take pictures of the palace during night, all lit but unfortunately the lighting is between 7Pm to 8Pm. However a walk around the city was interesting. We left Mysore early on Sunday and headed to Nanjangud. On the way we stopped at the Palace entrance to capture some pictures. Sri Kanteshwara temple at Nanjangud is a beautiful with a magnificent gopura and huge courtyard. 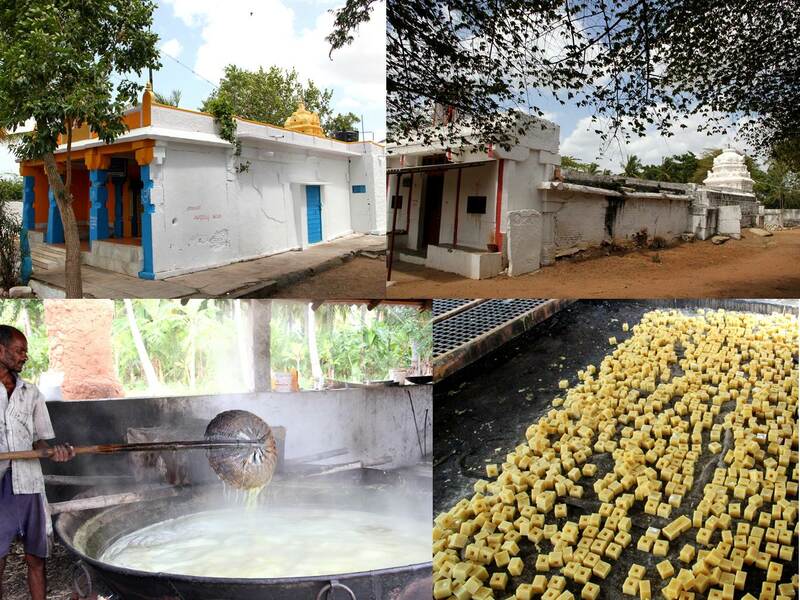 On our way to Chamrajanagar we stopped at a small village hotel– A hut with open kitchen. The owner took extra interest to attend the kitchen to serve his special guests. Few fresh dosas made a good breakfast. My father likes the hotels in the villages. Whenever we drive around Mangalore, we always make sure to stop at a village hotel to grab at least a cup of tea. The hotels in villages around Mangalore though have a special attraction. They serve the food that we normally cook at home and do not find in the men of a city hotel. Sajige-Bajjil, Moode, Biscuit Roti, Goli Bajje, Neer Dosa etc. The hotel owner suggested a shortcut to Yellandur. The road next to the hotel would lead us there he said of course with a right and left turn here and there. So we decided to try the interior routes than the main road. We passed through a village called – Santhemaramana Halli and then reached yellandur town to find it crowded with hundreds of people. 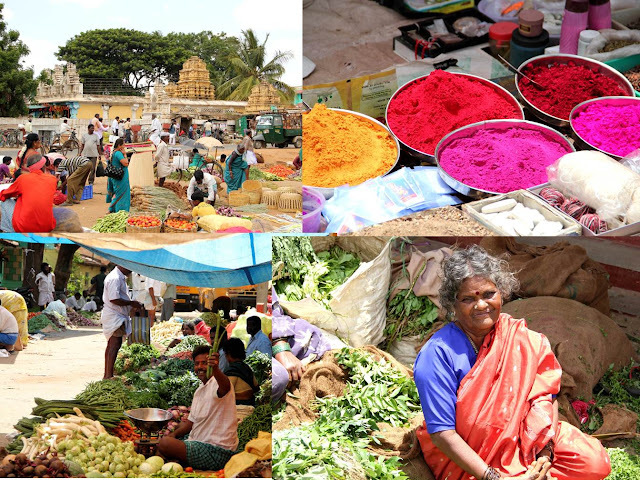 It was a day of Santhe (Market) where villagers once a week sell their harvest. We bought our share of vegetables as well. 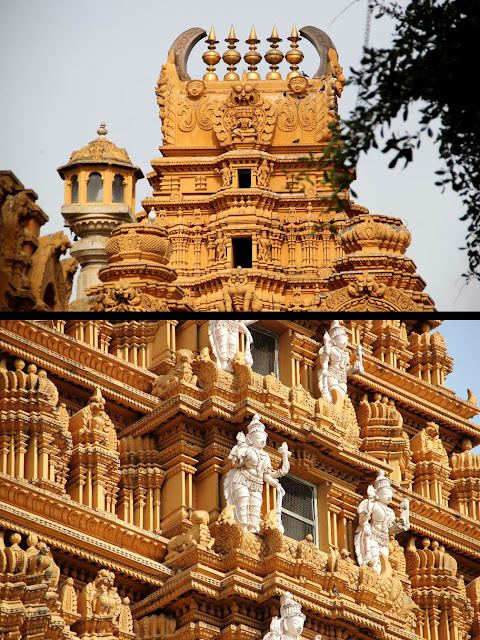 Yellandur town has two temples – Gaurishwara temple with a beautifully carved enterance called Balle Mantapa built by hoysalas. Rings carved out of the stone are the main attraction here. Vishnu temple with Varaha as the main deity was a rare sight. There are not many temples of Vishnu in varaha form with Bho devi on his lap (Goddess Of earth). A kalayanotsava (Wedding) was in process and the priest was kind enough to offer us an invitation to stay for lunch. The farmers at the vegetable stall were very eager and supportive of me taking their pictures and few demanded one and asked me to get them a print next time I visited. Next we drove to Chamrajanagar and found it a little difficult to find a hotel. The town is very small and the hotel that we tried would not let us check in till 5PM so after a Raagi moode lunch we drove to Haralkote. Narrow roads led us to tiny villages. At one place when we asked for directions the farmers just directed us to a village house where a function was in progress; perhaps an engagement or something and they by default assumed all cars for the day where driving there. Anyways after few detours we were on right track and unfortunately both the temples – Hanuman and Janardhanswamy were closed. It is said that Bhabruvahana (Son of Arjun) lived here. However as per the original story he must have lived in Manipur. Anyways, every place has its own versions of the epics. On our way we stopped at a small scale industry that makes jaggery and spoke to the workers about the process and even managed to get a free bite at the product which was actually more salty than sweet. We next drove to Chikhole and Suvarnavathi dam but anyway the heat and the dry reservoir prevented us from spending a lot of time there. Next stop - Channappanapura. This was a beautiful drive and the roads winded up a hill where the gopura of the Veerbhadraswamy temple stood tall and again closed. But luckily the priest had left his cell phone number and when we called he offered to be there in 15 minutes and so he did. Those fifteen minutes of wait for me was one of the best parts of this trip, because the temple was on top of a small hill overlooking nothing but trees and fields with no house or humans in sight. The idol was tall and intricately carved. 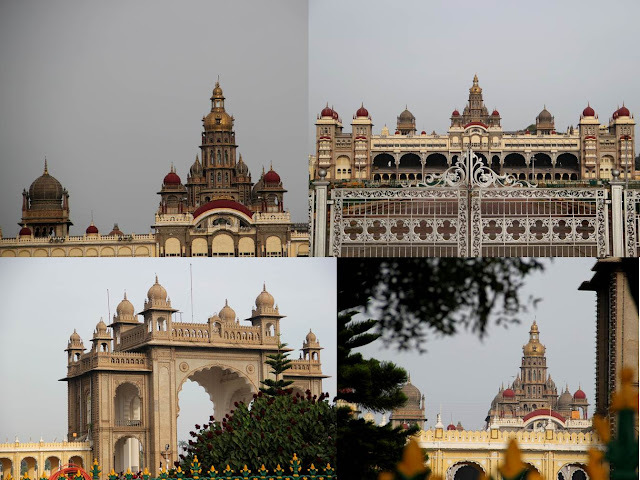 In our conversations we spoke of how Mysore palace still pays them Rs25 per month and the Government does nothing. The priests had to leave or had to find income through their farms rather. We drove back to the city and tried to locate a Jain temple. Two men tried to help us by asking me to follow their bike. They took us to the temple but it was closed too and was on such a narrow street that I don’t think I could have found it otherwise. Seeing us confused in the maze of tiny streets, they came back again and directed us to the main temple – Chamrajeshwara temple. The hotel was still not free to check-in so my dad be-friend a Mangalorean shop keeper who directed us to a hotel. We managed to get two rooms and settled in. We drove back to the temple and relaxed there for a while. The courtyard, Gopura and the carvings are simply beautiful. Colours from the evening sky made the place glow. After a quick dinner we retired for the day.